The final site was never released due to budgetary constraints (funding fell through before further financing was possible). I finished the designs for the user interfaces of the home page, the custom search application, portfolio views, profile views, media views, administration views, and several widgets. 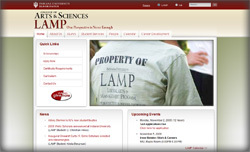 At the IU Alumni Association I assisted in the creation of an IU alumni social media portal (called MyIUAA). I worked with a developer who spearheaded the development project, while I led all aspects of design. I implemented the Flickr widget (the box on the far top right with the photos pulled dynamically from Flickr.com), created all graphics and icons for all widgets, and designed the user interfaces (other than inside the widgets, which were created from available APIs). 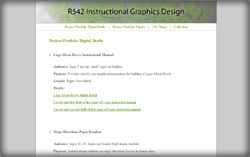 I created a variety of instructional images for a course on instructional graphics design. 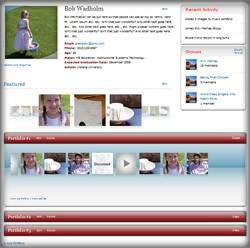 This project involved the creation of a Web site featuring these products, and the implementation of several media presentation forms (instructional video, static graphics, and a Flash carousel with 100 hand drawn computer graphics. I designed and developed the Web site and all materials. 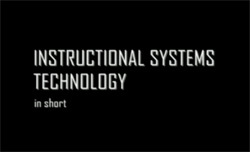 For a class on foundations in instructional systems technology, I created the YouTube video Instructional Systems Technology in Short as a no-budget five minute introduction to the field of IST. 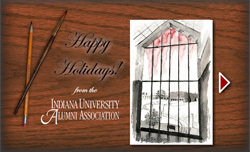 For two years I was the project manager and lead designer and developer of a Flash holiday card for the IU Alumni Association. An e-mail invitation to view the digital card is sent every year to over 240,000 IU alumni. The first card received over 50,000 unique views. For the first card, completed in December 2008, I was the concept designer, oversaw the creation and design of ten watercolor paintings of university campuses by the artist Jon Terzini, and remixed music provided by the IU Jacobs School of Music. 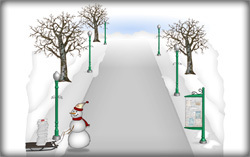 I designed and developed all of the Flash animations and functionality. The second card was released in December 2009. Concept design was by artist Petra Budarz. I designed and developed all storyboards, art, graphics, Flash animations, and sound, and music was provided by the Jacobs School of Music (Indiana University).